Technology is the application of science to solve a problem, create tools and processes. Technology is the purposeful application of information in the design, production and utilization of goods and services, and in the organization of human activities. Humans have used technology for over 5000 years - I would even say that advancements in technology have always benefited the way we live. Energy (a system's ability to perform work) has been the key in this regard. A gallon of petrol costs £5 and provides energy equivalent to 500 hours of human labour worth £3700. In other words, the amount of work that oil performs for you is equivalent to having hundreds of slaves working round the clock! Even the kings did not have the comfortable & luxurious life style that an average middle class family now enjoys - thanks to technological breakthroughs that made all this possible. Now, a fourth Industrial Revolution is building on the third. It is characterized by a fusion of the physical, digital and biological technologies. The fourth IR will fundamentally alter the way we live, work and relate to one another. In its scale, scope and complexity, the transformation will be unlike anything humankind has experienced before. Technological capabilities are increasing exponentially - changes are happening at unprecedented speed throughout the world - changes that are disrupting all industries in every respect. Transport, communications, efficiency and productivity in manufacturing will benefit and steer economic growth. All aspects of peoples' personal lives will be impacted seriously with unforeseen consequences for privacy, identity etc. Automation will disrupt the job market, many occupations will go as robots can perform them better - we already see industrial robots becoming more ubiquitous - but the changes in the next few decades will be far-reaching. 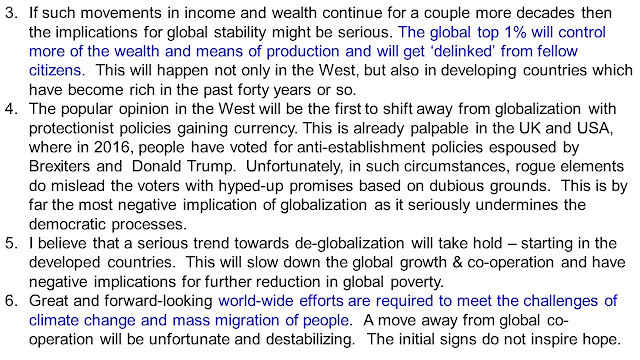 Our civilization has a big task ahead of adjustment to the looming challenges. Who will gain from the technological advances? 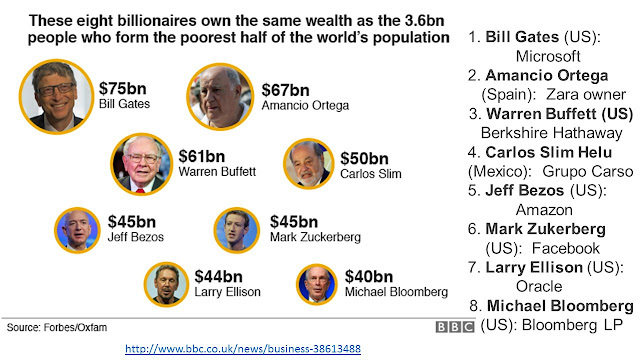 Will the richest in society grab all the benefits as they are best placed to exploit the situation? 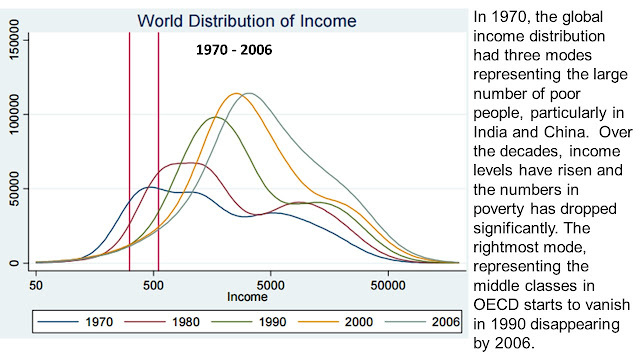 Will inequality increase in the world? 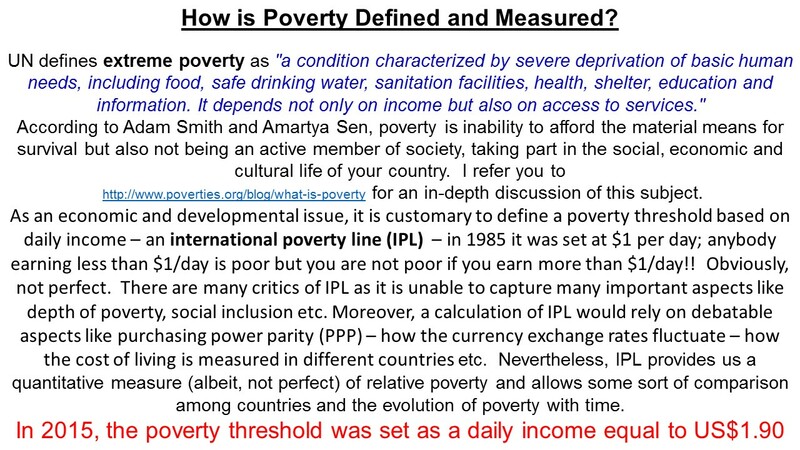 Will the poor be looked after and their standard of living improve? The third IR really made a difference. Technology behind this IR made transportation of goods and communications exceedingly efficient. 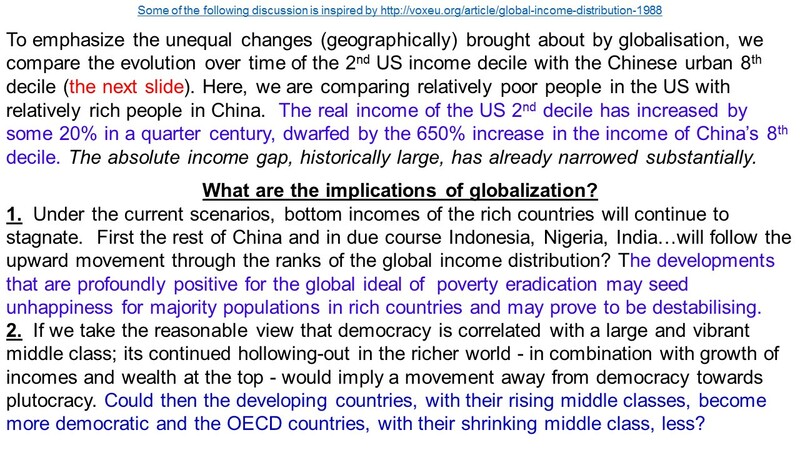 Developing countries in Asia and Latin America could produce all the goods and provide lot of the services that the OECD countries wanted and they could do it rather inexpensively - the labour was cheap. 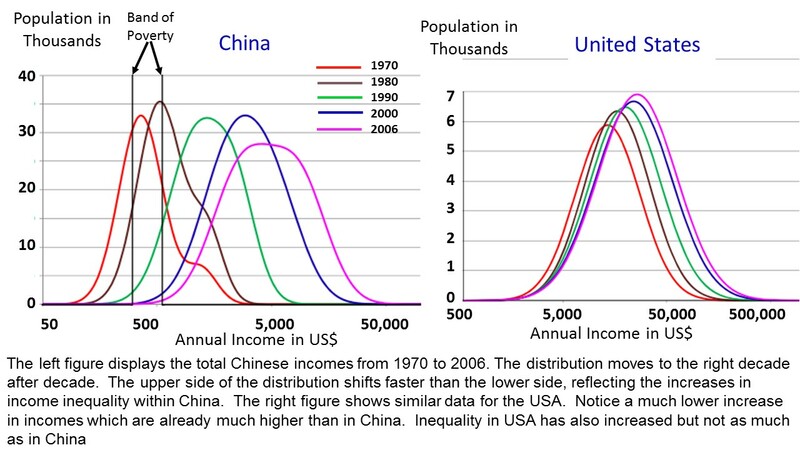 The result was that the period from 1970 onward saw a massive increase in manufacturing and services transferred to countries like China and India and others. 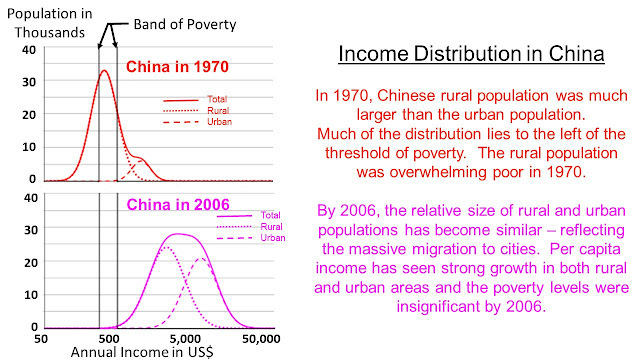 Globalization became established and benefited the indigenous populations in the developing countries. Their incomes rose and poverty levels came down. 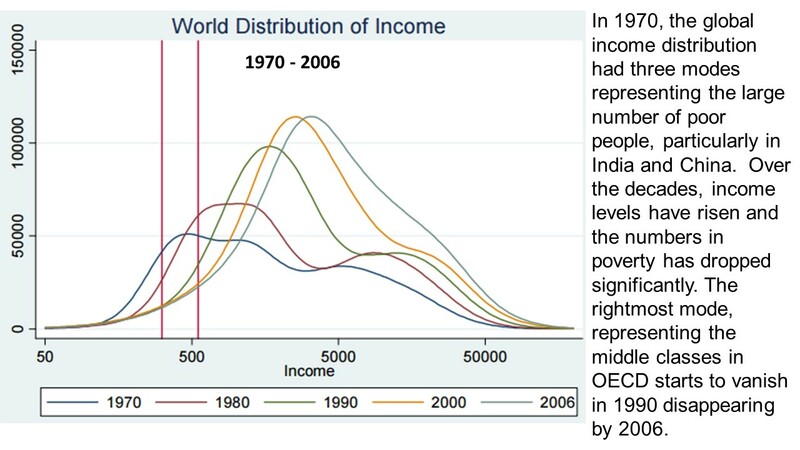 The next two slides show how the world distribution of income has changed since 1970 and that the absolute number of poor people has been decreasing steadily over the years against the backdrop of a rising world population. 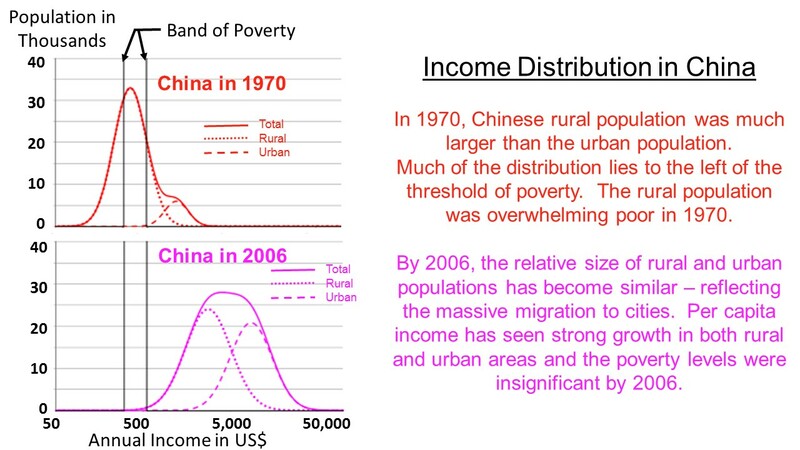 This is mainly due to the large number of people taken out of poverty in China and India and neighbouring Asian-Pacific countries. 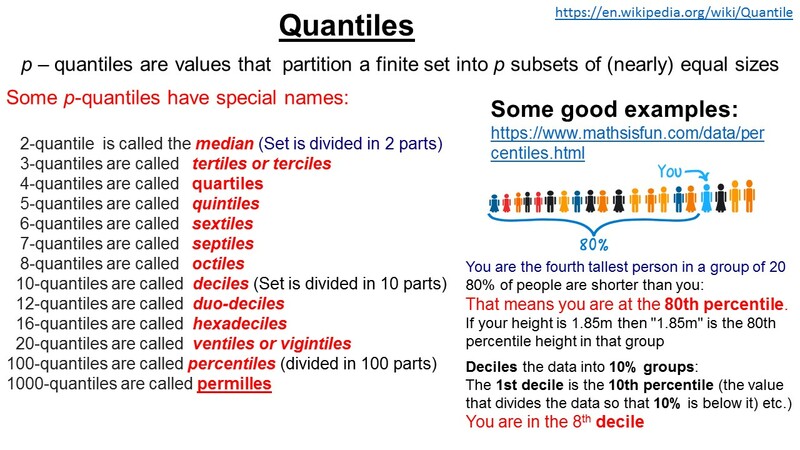 In the slide, y-axis shows number of people. 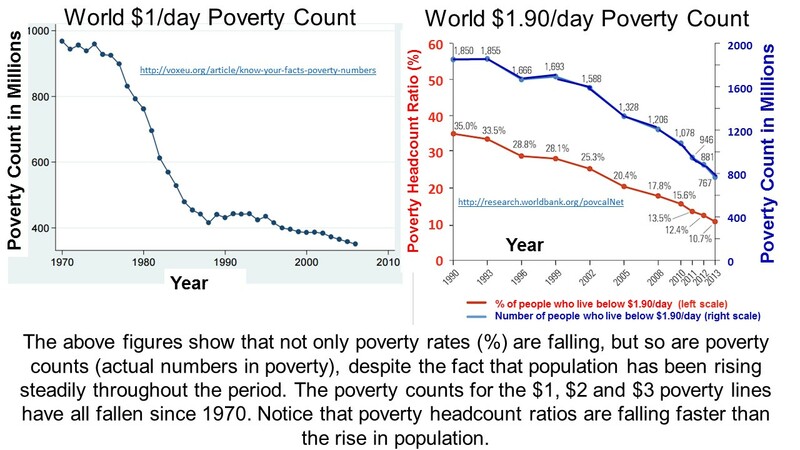 It appears that since the onset of the third IR, globalization has been instrumental in decreasing poverty throughout the globe. This is a positive outcome of technological advancements that have also helped to provide greater understanding of human health issues and tackling the food and water problems. Much more needs to be done in this respect - particularly in the African continent where people have not benefited anywhere near to the same degree by globalization. Of course, the industrial progress have had many negative impacts like global warming (climate change), increased pollution, mass migration, loss of biodiversity etc. These problems must be addressed with some urgency. 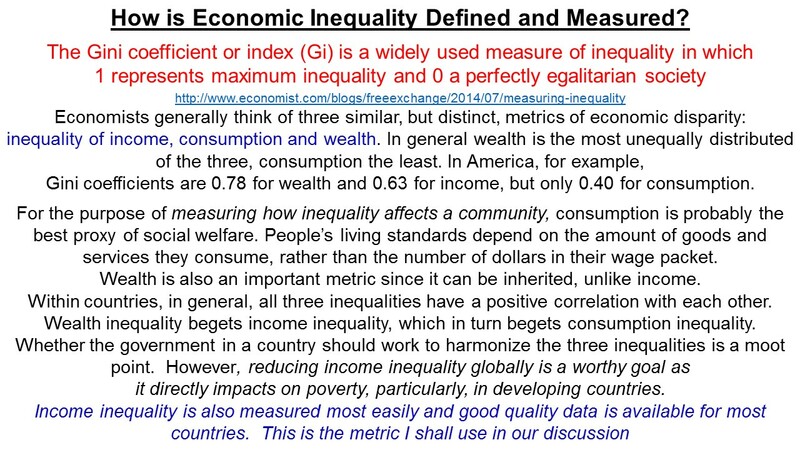 Returning to inequality, we are talking about economic inequality here, can one argue that reducing inequality should be a major goal of policy makers? 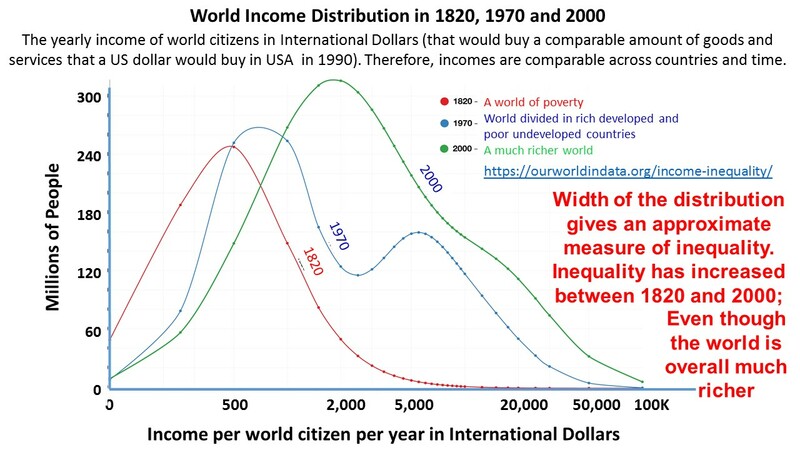 There does not appear to be a strong positive correlation between poverty (income levels) and inequality - rising incomes take people out of poverty but generally enhances inequality. 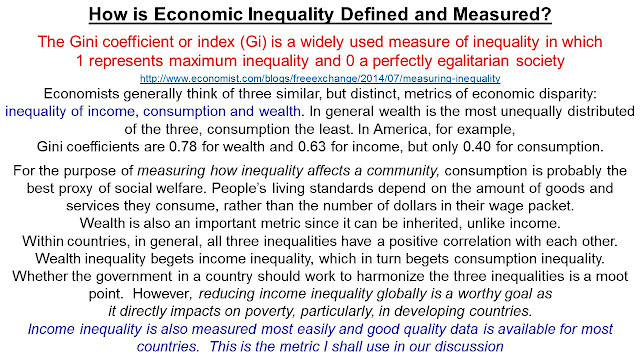 It is reasonable to suggest that inequality would enhance political instability & social unrest; thus impacting negatively on economic growth. On the other hand, inequality could spur more economic growth via higher incentives for wealthier people to make productive investments - as indeed most of the wealth is owned by a small percentage of the population. The World Gini increased from 0.43 in 1820 to 0.61 in 1913. Since 1913, Gini has been creeping up and stands at 0.68 in 2005. 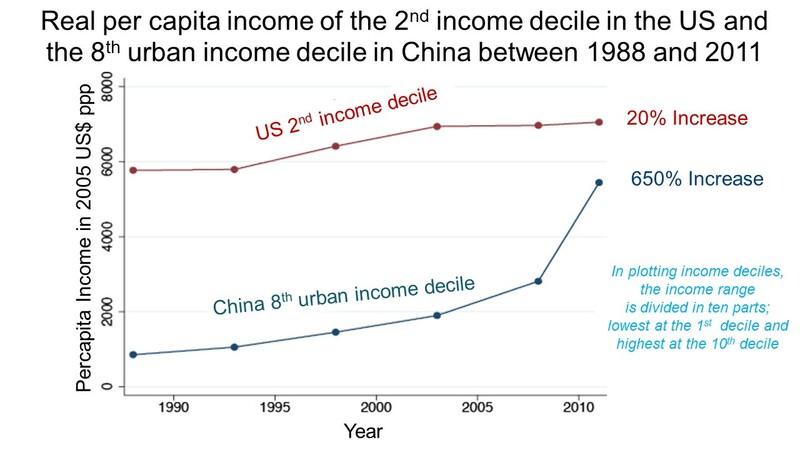 Unintended Consequenses of Globalization: During the 3rd IR, good efficient transport (energy has been cheap) and communications have helped the rise of globalisation. Goods made in developing countries - supported by low wage rates - could be transported to consumers in the developed countries. Out-sourcing of manufacturing and services has helped in reducing the poverty levels in developing countries. 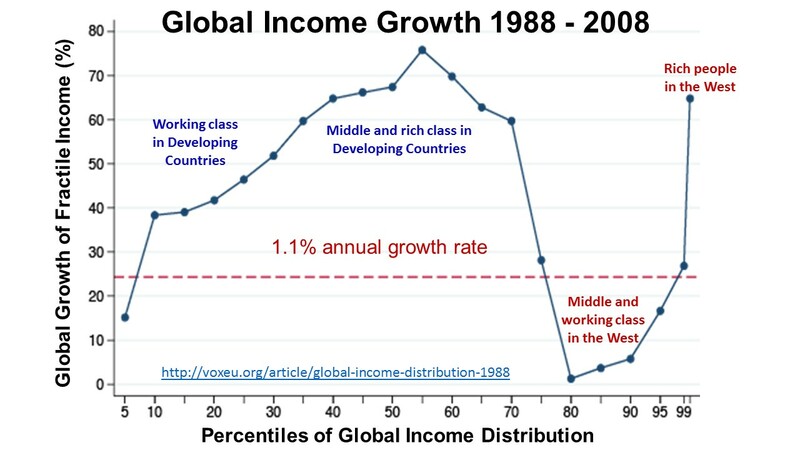 In this process, middle classes in the developed countries saw their jobs in manufacturing and servicing disappear causing stagnation of real wages and escalating job insecurity. 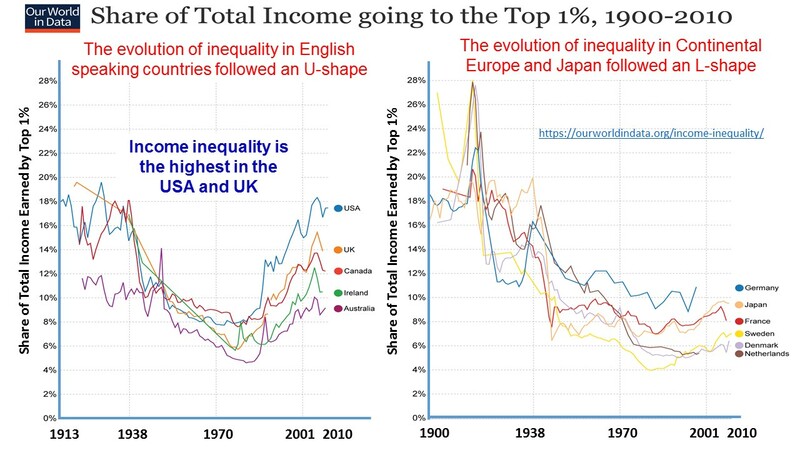 The following slide shows this remarkable situation over the period 1988 to 2008. Global income growth is shown for the 20 income ventile groups (Global population is divided into 20 groups). 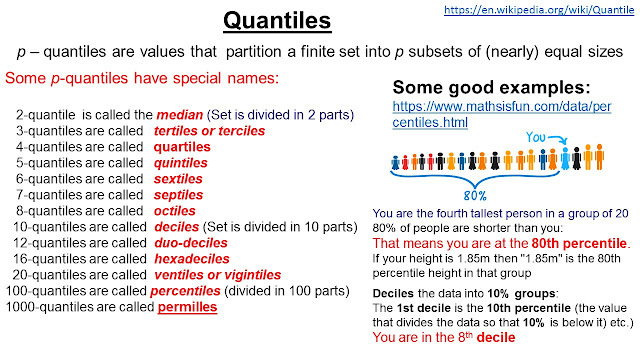 The first ventile (0 to 5%) are the lowest income group; the second ventile (6 to 10%) is the next lowest group and so on. 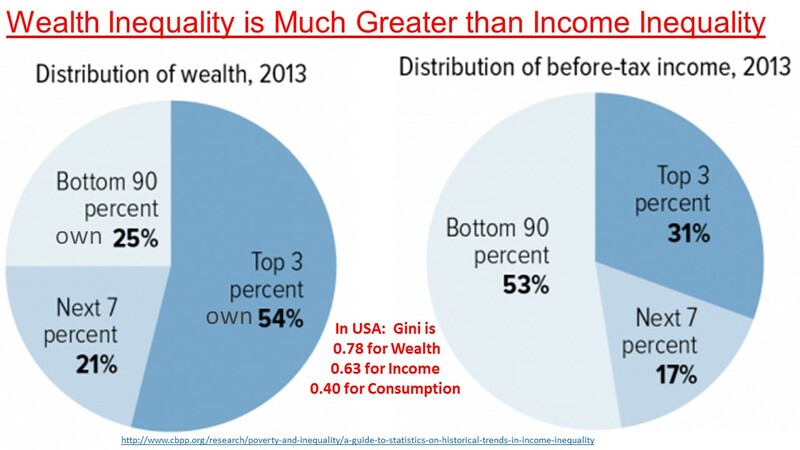 The 20th ventile (96 to 100%) is shown by dividing it into a quartile (96 to 99%) and a percentile (99 to 100%) to emphasize how much more the richest in the top 1% have gained. The distribution shows that the groups around the 50th percentile made the largest gains, ~75%, in income growth. The global top 1% also increased their incomes by about 65%. For the very poorest (0 to 5 percentile) and those around 80 to 90 percentiles, gains were negligible over the period of 20 years. Because the absolute income of the top 5% is much larger, they accounted for 44% of the increase in global income between 1988 and 2008. People are apprehensive about job security and fear that automation/robotics will make a large fraction of jobs redundant. Of course, new job opportunities will appear. This will require retraining which may be uncomfortable for many. In addition to automation, migration is also a big concern. Migrant workers generally are younger, work harder and show more flexibility. Under these circumstances, workers in the developed countries feel thtreatened and have started to react to the prevailing uncertainties. I am not surprised that the attitude towards globalization is not positive in most countries. 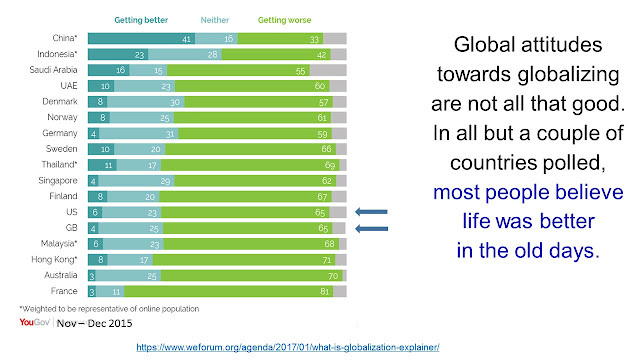 In a 2015 YouGov poll, majority of people thought that life was better in the old days. I have discussed the evolving economic situation in the world and tried to make sense of some recent political developments in the Western countries - notably UK and USA. While it is true that economic climate drives many of the social and political trends in a country, it may no longer be the whole story. Technological developments have infiltrated personal lives of citizens in a serious way; social media, smart phones, internet have been widely adopted and life without them is unimaginable. Gadgets now play an important part in setting the cultural norms in a society. What information is delivered to you is not under your control any more - the online service providers decide. Who controls the service providers? A handful of companies indeed. These companies wield huge power by influencing the way we think. Controlling information is subtle and is nothing like the historic way of doing so as practiced in totalitarian regimes. Your personal profile determines what information should be sent to you. 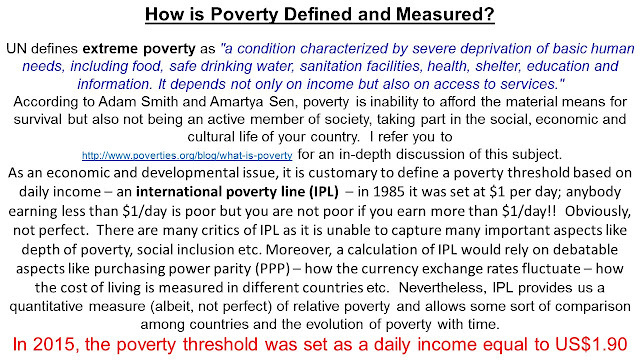 Final Word: Economic poverty and inequality have received much attention by policy makers. 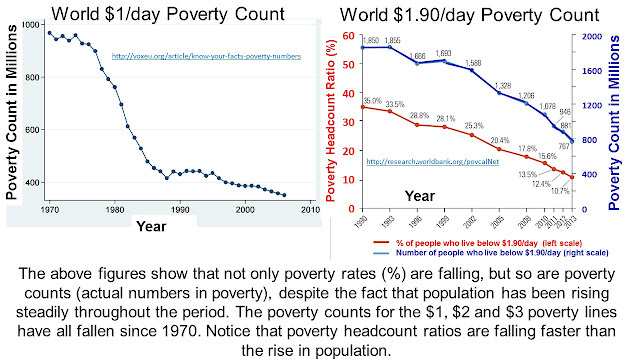 Extreme poverty is much reduced globally but inequality has been creeping up. There is more to life than income and wealth. After a certain stage, money loses its charm and people search for other attributes in the society - like social inclusion and fairness. 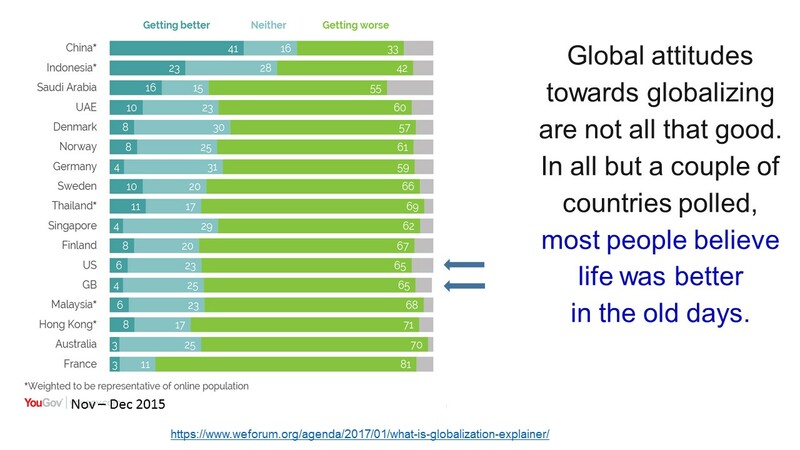 Happiness is not determined by GDP alone. 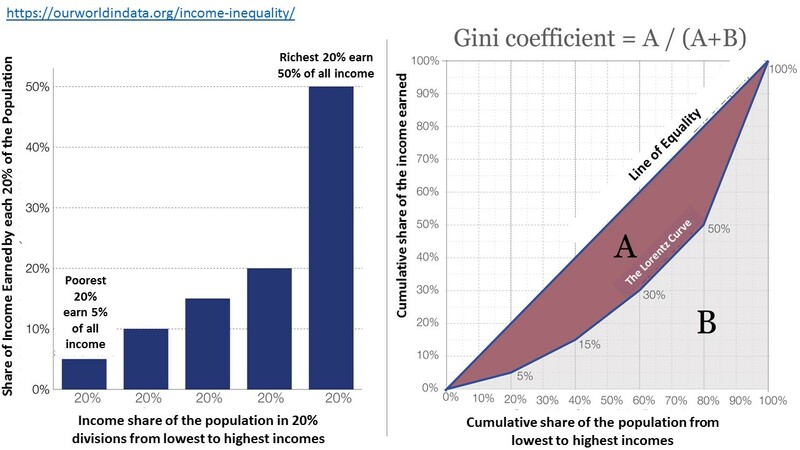 Taken to extreme, total equality (Gini = 0.0) will be most undesirable. The policymakers have a daunting task to first decide on the parameters that make life fulfilling and then devise policies to achieve those goals.